July 21 - Monday Pleasant, All about as usual Lena up early & at the washing which had out of way (with some extra cleaning up) in A.M. Of course I was busy in kitchen part of day, doing more cleaning up, expecting Lena is going "[harvesting"] soon. Also at jobs repairing. 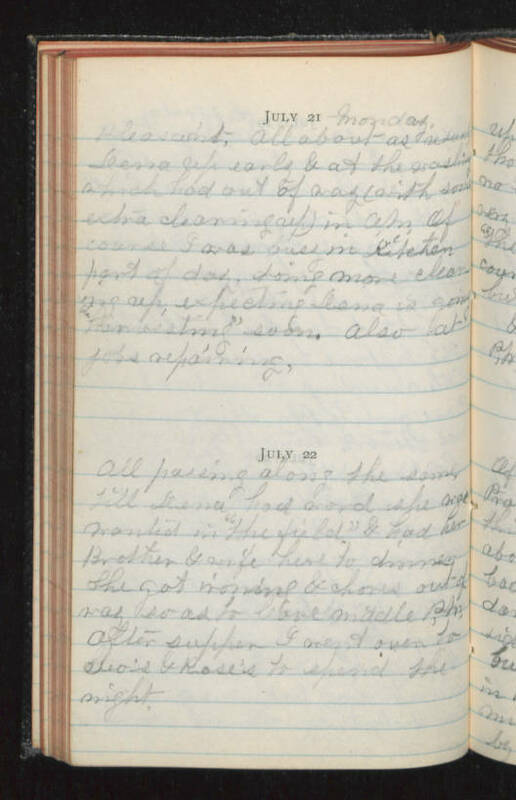 July 22 All passing along the same till Lena had word she was wanted in "the field" & had her Brother & wife here to dinner. She got ironing & chores out of way so as to leave middle P.M. After supper I went over to Geo's & Rose's to spend the night.